This entry was posted in Reading Tour on July 13, 2017 by Wolfgang Rauter. The architect Christopher Alexander starts his preface with a stark criticism of today’s architecture and the people responsible for this development – architects, builders, planners, and financiers. He speaks of a form of a contemporary architecture which is against life, insane, image-ridden, hollow, ugly, pretentious and banal. Even though most of this construction is caused primarily by developers, architects are not blameless and in many cases, their contribution make it worse. Alexander points out that in traditional society building was almost always something that stood for human value, that raised life to its greatest possible heights, that supported a spiritual and meaningful conception of human existence. Today, architects cater to the developers, creating works which are not friendly to people, or to the human spirit. Alexander states that it can only be madness to explain why a group of people entrusted by society with the creation and preservation of our physical world, so sadly undermine it and become collaborators with the enemy. Architects are not happy with this development, according to Alexander, any more than other members of society are. Many think that something must be done, but the problem is they do not know how to set about such a change. The reason: they do not know the true cause for this destruction. Alexander claims to know the cause. He is convinced that architecture is so agonizingly disturbed because architects are struggling with a conception of the world, a world picture, which is mechanical in nature – what one could call the mechanist-rationalist world-picture – which essentially makes it impossible to make buildings well. This mechanical world-picture, stemming from 19th-century picture of physics, assumes that all the universe is a blind mechanism, a world made of atoms which whirl around in a mechanical fashion, under the impact of the “laws of nature”. Alexander critically names different facets of modern architecture: The strange fantasies, the private in-house language about architecture, the strange nature of 20th- century gallery art, deconstructionism, postmodernism, modernism, and a host of other “isms,” all of these affect the physical world hugely and are created because of an entanglement between the nature and practice of architecture and this mechanical conception of the universe. Alexander takes a closer look at the mechanistic conception. He recounts how the mechanistic idea of order can be traced back to Descartes. His basic idea was: if you want to know how something works, you can find out by pretending that it is a machine. You completely isolate the thing you are interested in from everything else, and create a mechanical model to find out how it works in the modern sense. Alexander emphasizes, that this business of isolating things, breaking them into fragments, and of making machinelike models of how things work, is something we do, in order to understand something – but it is not how this thing actually is. Descartes himself clearly understood his procedure as a mental trick. Alexander observes that in the years since Descartes, people have shifted into a new mental state that treats this mechanical picture of reality as if was the real nature of things, as if everything really were a machine. Alexander then goes about to describe the manifold consequences which this mechanistic conception has had on architecture. The first consequence of this mechanical approach, according to Alexander, was that the “I” went out of our world picture. The picture of the world as a machine does not include the inner experience of being a person. The absence of the personal inner life leaves the art of building in a vacuum. The second consequence of the onset of the 20th-century mechanistic world-picture was that clear understanding about value went out of the world. In the picture of the world we have from physics, value has become sidelined as a matter of opinion, not intrinsic to the nature of the world at all. For Alexander, the impact of this thinking on our world has been enormous. It has created a mental climate of arbitrariness and has laid the foundation for an architecture of absurdity where architects are forced to make different idiosyncratic choices, elevating particular goals above all others and making it the basis for their work. He brings examples, such as Buckminster Fuller, for whom weight was the paramount goal, making buildings which span the longest distance for the least possible weight. Or Le Corbusier, for whom the separation of functions was supreme. All these points of view are understood to be individual, legitimate, and inherently in conflict. In the mechanistic world-view originating with Descartes, Alexander describes, it is believed that the only statements about mechanisms can be true or false statements. These are the so-called “facts” familiar to everyone in the 20th century. Contrariwise, the statement “A pale yellow on this door has more life than a dark gray.” is an example for a statement of value. Within the canon of 20th-century science, these are not considered statements which can be true or false. They are thought of as statements of opinion. Here Alexander sees a big problem: Within a world-view in which statements about value are not allowed, by the accepted canon, to be considered as potentially true or false, we cannot legitimately discuss what we are doing as architects with any hope of reaching consensus, a rational discussion about buildings becomes impossible. The Root of the Problem: our current Idea of Order. Alexander is convinced, that as long as we are – even unconsciously – prisoners of a too-simple mechanical picture of matter, it is inevitable, that architects – and the architecture they create – must continue in this blind confusion which too many of have experienced for more than half a century. For a solution, Alexander finds it necessary to deal with the underlying ideas. The idea of matter – be it the present mechanist-rationalist conception of matter or the harmonious-coherent conception which he wishes to put in its place – is essentially governed by a certain idea of order, how space can be arranged. Alexander states that it is the nature of order which lies at the root of the problem of architecture and which needs to be defined. Hence the title of this book. That is Alexander’s effort in this book: to show how architecture can be made whole again, through a new picture of the nature of order, and subsequently through a new picture of the nature of matter. Scientists have been trying to define order for about a century. But none of this is useful to a builder. Alexander asks, what is order? Scientists and modern physics have been trying to define order for about a century. But none of these definitions, according to Alexander, is directly useful to a builder. Even the most advanced of these ideas is still not deep enough, or concrete enough, to give us practical help with architecture, where we actually try to create order every day. Alexander describes how, on the one side, everything in the world around us is governed by an immense orderliness. It is the changing arrangement of the sky, the clouds, the flowers, leaves, the faces around us, the dazzling geometrical coherence, together with its meaning in our minds. On the other side this beauty, this geometry which means so much, according to Alexander, which makes us feel the presence of order so clearly – we do not have a language for it. Furthermore, architects do not know how to create such order. Even the smallest building has order of great complexity. What kind of order should it embody, to make sure it is a success? How to make buildings which have profound order? That order which exists in the yellow tower. Alexander brings (amongst other examples) the example of the Yellow Tower (The Tower of the Wild Goose, Hunan Province, China, AD 600) to illustrate the qualities of this order. This beautiful building, states Alexander, has the smile of the Buddha, of life and simplicity. It moves us in the heart. This order cannot be represented as a mechanism. Yet it is precisely this harmony, this aspect of order, which impresses us and moves us when we see it in the world. So what, indeed, asks Alexander, is that thing we intuitively feel as order in this building? None of the modern theories of order are capable of helping us understand the profound and immensely subtle order of this building or to describe it. Subsequently, we therefore have no conception of the order which helps us create the profound life that can exist in buildings and in other artifacts. Alexander states, that it is vital for architects to make buildings which have life and profound order. To achieve this aim, it is necessary to concentrate on the life and order of a building as something in itself. Alexander believes that such a formulation can only come from a new view of the world which intentionally sees things in their wholeness, not as parts or fragments – and which recognizes “life,” even in an apparently inanimate thing like a building, as something real. With this new view of order, Alexander develops in his book a new theory in which statements about relative degree of harmony, or life, or wholeness – basic aspects of order – are understood as potentially true or false, creating a world in which the relative degree of life of wholes is a commonplace and crucial way of talking about things. Consequently, Alexander states, the success of such a new view of order will create a new relationship between the ideas of ornament and function, which up till now have been cut off from each other. One being serious, the other frivolous. This new conception of order which lets us see buildings as both functional and ornamental at the same time, revealing two different aspects of a single kind of order. A further consequence, and for Alexander even more important, is the discovery that the structure he identifies as the foundation of all order is also personal. He wishes to resolve the Cartesian dilemma, and make a view of order in which objective reality “out there” and our personal reality “in here” are thoroughly connected. With the promulgation of this new view, Alexander is convinced that the life of a building will become visible as something empirically real. All shall see that the yellow tower empirically has more life than modernistic buildings. This will become objectively clear not as a matter of opinion, but as a matter of fact about the order they contain. At that stage, man will not only have a concrete grasp of order as a single phenomenon which affects all of architecture, but shall also be led to a view of space and substance which is transcendental and which reaches beyond the present material view of substance, and beckons to some domain beyond the limits of space and time. The new view will present the world as an altogether different kind of place from the one people have imagined. When the new view of order has taken place, Alexander is certain, everything will look different, not only buildings. 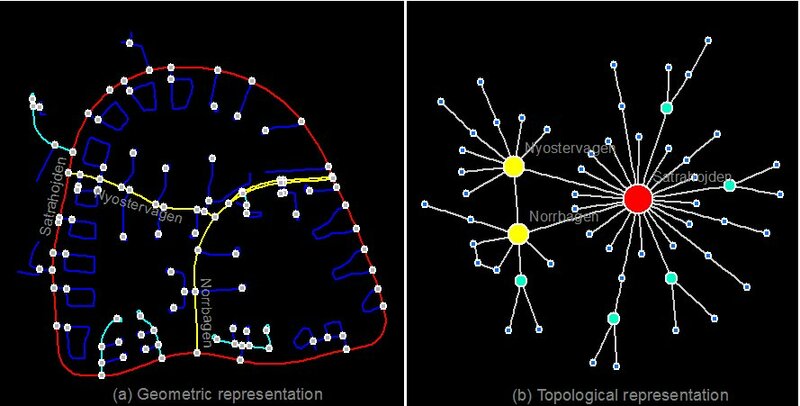 Note that the nodes to the left as NOT those to the right in the previous figure, which indicates differences between the geometric and topological representations. 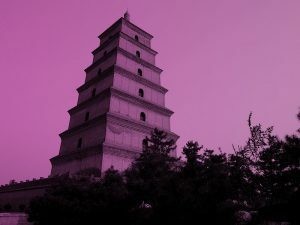 First, to get a better impression of the Giant Wild Goose Pagoda, I suggest to follow https://www.google.at/search?q=Giant+Wild+Goose+Pagoda and its “more images” option. The image above, in wrong colors, and distorting the proportions, in a wide-angle perspective that is not the natural way our eyes perceive it, may give a false impression of the building. Many images also show this pagoda in an architectural context, and a city context; and context is of utmost importance. Second, one should note, that the Giant Wild Goose Pagoda of Xian is not identical to the “Tower of the Wild Goose, Hunan Province”, which Alexander chose as exemplar on page 11. This may or may not be important, at this point I leave this question to the discussion. A full photo of the building in its context is a good idea – The pic of the Giant Wild Goose Pagoda on this page is just implemented as a symbol of the building. I will keep it in mind. I searched for a photo of the Tower of the Wild Goose in Hunan Province for quite a while but could not find any. I only found the Giant Wild Goose Pagoda of Xian. The pictures of both are so similar, even the layout of the surrounding buildings, maybe there is no Tower of the Wild Goose in Hunan Province?